Walk over the narrow pack horse bridge and take the right hand path which follows a green lane to join Back Lane. The house on the right was once the notable World’s End public house. 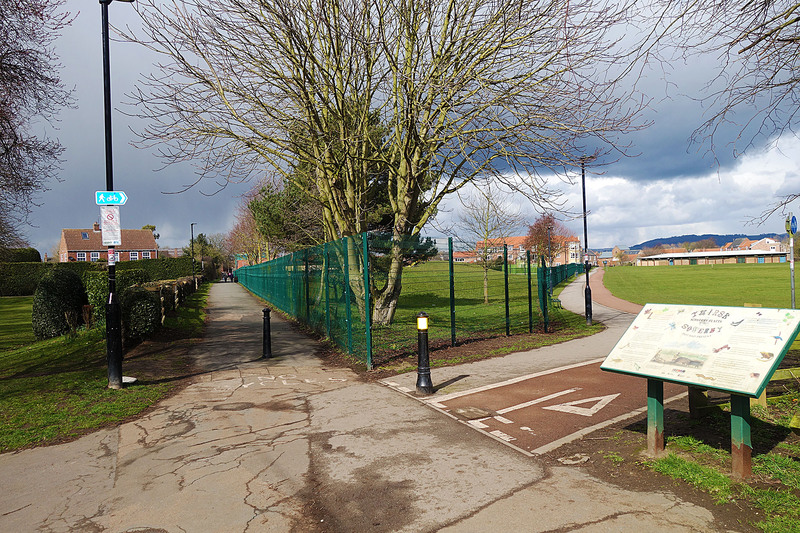 Turn right and go down the gentle slope to join Front Street, the main street of Sowerby. Turn left and walk up the street. Notice the timber-framed house on the left at the junction with Gravel Hole Lane and the large houses on either side of the street built by the prosperous business people of the town. Also note the three Regency houses on the right with steps up to the entrance over the basement. Just before the church on the right is an ancient house called Manor Farm. A building has been on this site since 1304. Note the splendid dovecote in Manor Farm field. Detour to see St Oswald’s Church, dating from about 1140, with its Norman door on the south side. Continue up the street to find board 13 which is on the right near the The Flatts. Long a parish in its own right, the township of Sowerby was once a chapelry of the parish of Thirsk. There is in its name, evidence of its ancient Danish origins in which language the syllable "by" signified originally a single estate or farm, later a town or village. 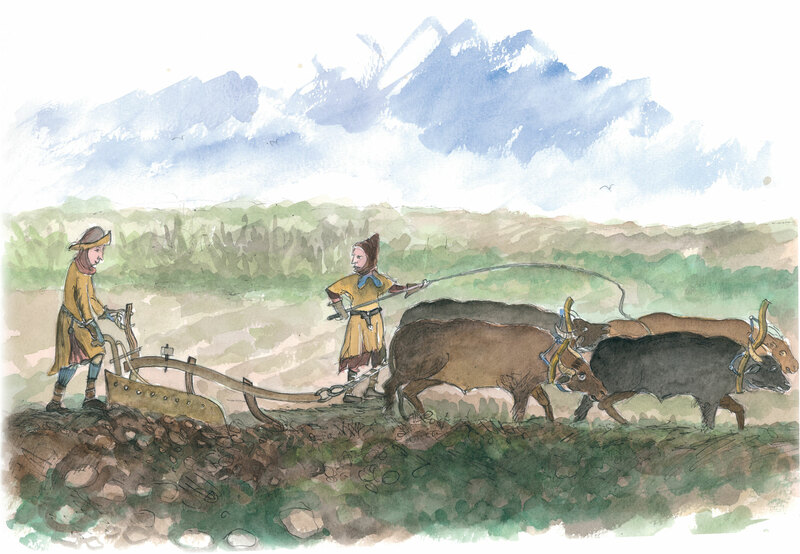 In medieval times the land would have been cultivated using a wooden plough and a team of oxen. The action of ploughing over the years left furrows where the earth was cut along the length of the land and ridges where the soil heaped up beside the furrows. The corrugations increased the land surface in which crops could be grown and the furrows helped with water drainage in wet weather. Seed was scattered by hand and children acted as scarecrows over the following months by scaring away birds that would try to eat the seed and young crops, which were mainly wheat, oats, barley and peas. Evidence of ridge and furrow farming can still be seen today in the area known as Miss Warner’s Field and in other fields along the Cod Beck. A much wider variety of crops would have been grown in the past for local trade and manufacturing, including flax for weaving into linen, long-stemmed wheat for roof-thatching and hemp for rope making. In 1798 an Act of Parliament was passed for enclosing the open town fields of Sowerby, most of which were converted from arable to grassland or "flatts", the term used for open grazing land. In the 18th century canal systems were developed for the transport of merchandise. Lock Bridge was built using stone from an unfinished lock, which would have formed part of the planned canal system for the Cod Beck but the project was abandoned (see Canal Wharf board 10). The Thirsk and Sowerby Flatts Preservation Trust (a charity) was established in the 1950s to administer the area. The Flatts were purchased by the community in 1959. As well as providing grazing for sheep and cattle this is a favourite place for recreation and outdoor activities. The Swimming Pool, built on Flatts land, was the only one in England at that time (1971) to be built by public subscription, following the earlier death by drowning of three local boys in the River Swale and the Cod Beck. In 2002 permission was granted by the Thirsk & Sowerby Flatts Preservation Trust for the restoration of native plant species in Miss Warner’s Field. In the emerging meadowland and hedgerow can be seen plants which, under traditional farming practices, were a source of food, medicines and materials. The area also provides a rich habitat for wildlife. Miss Warner, more widely renowned as Mrs Pumfrey in the books of James Herriot, bought the field to preserve the view from Thorpe House, her house across in Sowerby Road, and in 1976 gave the field to the Thirsk & Sowerby Flatts Preservation Trust. In the distance can be seen the Hambleton Hills.